Stand the X-T3 up against any camera of its type in the same price bracket and it'll more than hold its own. Whether for stills, video, static or moving subjects, this Fujifilm takes the benchmark set by the X-T2 and raises it yet another notch. In the camera market we've seen established models bring successors that might add a new arty filter mode and not much more. Hardly upgrade material, eh? Fujifilm isn't playing that moderate upgrade game though: the X-T3 may indeed add a couple of new filters, but it also considerably upgrades the sensor, autofocus system and speed, while tweaking the design for the better. Oh, and it's thrown in 4K movie capture at 60fps too. First up, the X-T3 is made of four main magnesium alloy panels, not three like the X-T2, ensuring a robust build and the weather-resistant features you'd expect. This also makes for a slightly larger footprint, but only by a matter of millimetres, which will only be an issue for those with an X-T2 optional battery grip (because it won't fit the X-T3, so you'll need to buy the new one instead). Elsewhere the X-T3 refines the design of its predecessor, shrinking the exposure compensation dial size, adding a dioptre adjustment lock (although it's pop-in/pop-out mechanism is fiddly in relation to the ISO dial next to it), and enlarging the rotational dial toggles for easier adjustment of drive mode and metering. Even the latch on the tri-adjustable LCD screen is a whole load less fiddly than the one on the X-T2. Which is handy, because quickly adjusting the X-T3's screen into a waist-level or overhead position in either portrait or landscape orientation is easy peasy. Shame the screen can't be stowed backwards to protect it from possible scratches though. The screen itself isn't different to the X-T2, but with a decent resolution over its 3-inch format, that's just fine. The big new addition is touch control, which gives the option of quick adjusting the focus area, among other settings adjustments. Overall we like the addition, but would prefer greater sensitivity and speed in response - or even the option to tweak this response within the settings to stop it being a little lacklustre in its response (although too responsive and your nose/knuckles/face/anything and everything will cause unwanted adjustments). Above the screen is the built-in viewfinder, which in the X-T3 is uprated with a new higher resolution OLED panel. It's certainly got all the pixels crammed in, but certain tight patterns can cause a real-time moire to visuals (that won't show in image capture, we hasten to add). Still, with its high refresh rate, deep contrast, and massive 0.75x equivalent magnification size it's a formidable finder at this level. It's good enough to rival the Panasonic G9 and Canon EOS R.
Although its design is marginally different, the push to features sees the X-T3 step well ahead of the X-T2 straight out of the box. Thankfully Fujifilm has removed any confusion with the maximum speed/burst rate, as the X-T2 had various options available depending on whether or not the accessory grip was added. In the X-T3 it's 11 frames per second straight out the box, no additions required, which sees it match the enlarged X-T2 at its best. Good stuff. But it's really the autofocus setup that's advanced. Not only do touch controls assist in its use, the new sensor (which we'll come to in a moment) has a massive 2.16-million phase-detection pixels embedded across its surface, designed to cover the full width of the sensor. That means you can focus anywhere in the field of view, as far vertically or horizontally as you wish, and still acquire the same focus ability as you would in the centre. The autofocus system is pared down to 425 areas maximum, however, which can be further reduced to simplify operation as you wish. The AF point can be adjusted between a variety of point sizes, too, by using the rear thumbwheel. There's still no Panasonic-style Pinpoint mode, however, which we always miss when using other brands' mirrorless cameras. Fuji claims the X-T3 will be 1.5x faster at focusing than the X-T2. It might well be... in some scenarios. Don't get us wrong: it's certainly fast. But with the smallest point selected and when using a 35mm prime lens, for example, the focus isn't as lightning fast as it can be with more adept lenses. So you won't feel that bump at every turn, although the overall speed and response is impressive. Get the right lens on the front, however, and the performance cranks up a notch. The X-T2 showed off how well a mirrorless camera can continuously autofocus, with the X-T3 picking up where its predecessor left off. There are custom settings, much like you'll find in a pro DSLR, for the system to ignore interrupting subjects, be aware of subjects coming towards/away from the camera, and so forth. Shooting at the Goodwood Revival motor show, it was possible to shoot cars coming around the track's chicane using the 11fps burst mode and tracking focus, with a good proportion of frames remaining sharp, while the background blurred with motion. There's more too: a 1.25x crop Sport Finder mode presents a digital frame edge within the finder and on the LCD screen, so you can compose and predict what will enter this frame. If you want to shoot at super-fast burst using the electronic shutter than up to 30fps is available (at the 1.25x crop), which will fire silently - and so will be particularly useful for certain sports photographers. As we've said of all mirrorless cameras to date, the X-T3 won't best a top-spec DSLR for continuous autofocus, with some fail rate of the continuous autofocus latching onto foreground or missing the precision focus area, but given all the mirrorless cameras that we've used it's this Fujifilm that stands out above and beyond its peers. Finally, continuous focus isn't a barrier from a camera of this type. Other improvements have taken place, too, with Eye Tracking AF a particularly quick feature to latch onto a subject's eyes for precision portrait focus. 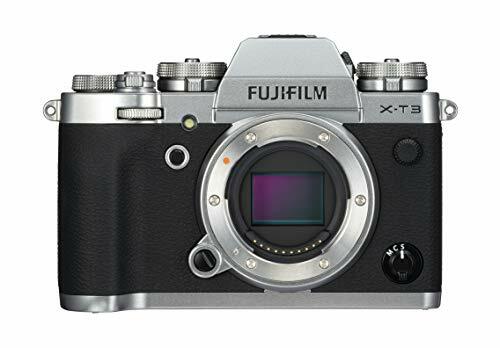 The wide incidence that the X-Trans CMOS 4 can receive light makes it f/1.0-ready, Fujifilm says. Which isn't a surprise, as the company has a 33mm f/1.0 prime lens in the works, which is likely to show itself in the not-too-distant future (we believe, but there's no official comment on this - and believe us, we've asked plenty of company representatives). Even without that lens in existence yet, the expanded range of Fujifilm's optics means there's something for more or less every situation. For this test we've predominantly been using the 40-150mm f/2.8, 18-55mm f/2.8-4, 50mm f/2.0, and 90mm f/2.0. Such wide aperture lenses show off the level that Fujinon lenses are at, which makes a massive difference in use. From shooting in a dim-lit hotel room, to capturing racing cars around a track, or candid moments with an electronic shutter, being able to shoot f/2.0 on a large sensor size delivers a clarity and background offset that's quite magical. No, it's not full-frame, but the X-T3's pictures often look like they could be, if using the right lens. Daylight is where things really shine. The ISO 160 baseline still isn't a low as we'd like, but there's an extended ISO 80 option to help keep that aperture wide open as needed. Some of the shots we've snapped candidly with the 50mm prime lens are exceptionally sharp (ok, there's some colour aberration, but it's not the world for the sake of £430). We've always praised Fujifilm for its image quality prowess. And the X-T3 continues the trend. Hit ISO 3200 and the sharpness dissolves in place of grain, but even ISO 6400 is a usable ISO sensitivity (just look at the wooden lion statue photo above). Last up there's video capture. And Fujifilm isn't mucking about here. Indeed, the X-T3 is the only APS-C sensor camera that can shoot 4K at up to 60fps. Sony offer 30fps from the same format, while Panasonic's smaller Micro Four Thirds sensor doesn't fulfil the same caveat. Now that's an important statement, especially from a brand that makes Fujinon cinema lenses. The X-series will now be seen as an even more formidable video-capture machine. And that'll be true if you're shooting to SD card or off camera, because the X-T3 can shoot 10-bit 4:2:0 direct to card (or 4:2:2 10-bit to 400Mbps clean via HDMI output). With H.264/H.265 codec options, hybrid log gamma (HLG) compliance, and audio controls (24-bit 48kHz), the X-T3 has a considerable video setup that's not to be taken lightly. Overall, the Fujifilm X-T3 manages to take one of the best all-round compact system cameras and make it better in every department. It's a mirrorless marvel, that's for sure. There are still some areas that could be further refined: certain lenses won't make the most of the autofocus system; there's still no true Pinpoint autofocus; the touchscreen lacks speed in response, or can be too easily prodded to cause accidental focus point shift or Sport Finder activation (no pleasing either way, eh? ); and some settings are arguably a little fiddly. But, ultimately, we're nitpicking.